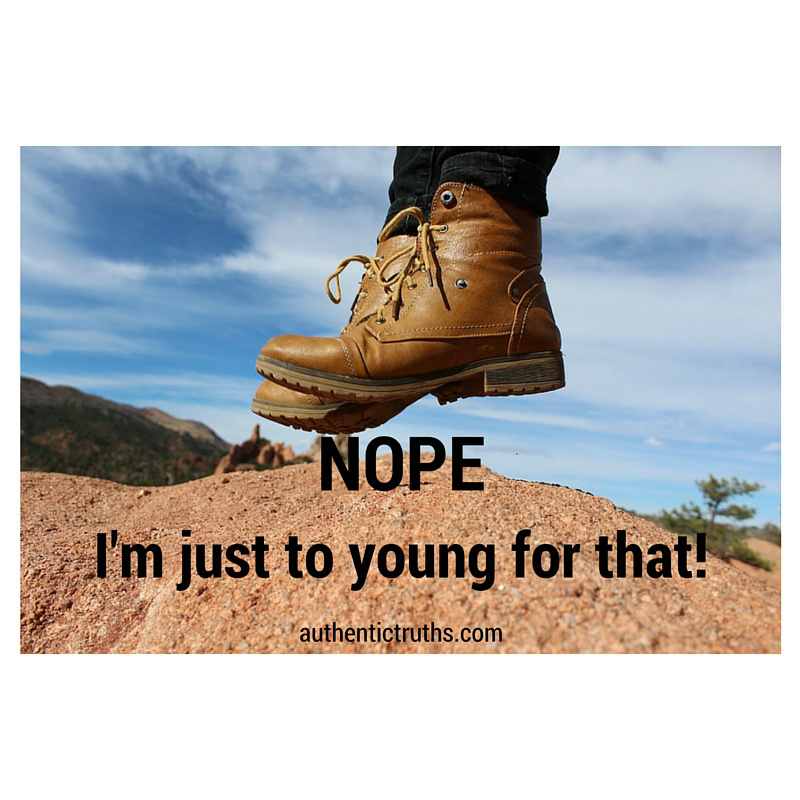 Nope, I'm just to young for that! I spent the last weekend alone. Like literally. Well, I had my puppy girl, Emma, with me. It’s a strange feeling to be so alone, to have very little to no communication with anyone for a few days. I did odd jobs around the house, but for the most part I never spoke a word unless it was to the dog. Have you spent time in silence like that? I’m a mother of four kids, I’ve been married for near 20 years, I’m always on the go. So for me, this was new. I spent some time with God, and also took this tranquil time to be in some deep thought about many things. Sometimes, when we feel lost, God opens the doors to see the reality that we’re just in a different time of life, and that time is valuable and necessary. The silence I was surrounded by was exactly where God needed me to be. Last week I dealt with some health news that isn’t life ending by any stretch, but it was a bit of a downer to receive. I’m not ready to hear I’m getting older, certainly not by doctors who are now 20 plus years younger than me! But there was the news- BAM! I thought I was catching these glimpses of the future, but it turns out, those little peeps were actually my current reality! Things aren’t coming, they are already here! To make things worse, some issues are coming quicker than they do for most women. I’m ok with this. I had a partial hysterectomy very young, so I was semi prepared for the aging process to remind me ‘I’m aging’.. sooner than most women my age. It’s not the changes that are taking place, it’s the way it was presented to me by the doctor. “You’re drying up.” (my ovaries) Really, that’s how you break this news to a young, vibrant and slightly lacking in self-esteem woman. (young by my own standards). So. What comes to your mind when you hear those words? Ya, me too. There was another comment made that I refuse to share with anyone else, because it just hurts too much. I can just tell you that I may not have the right ‘female’ doctors for this time in my life. They may not realize how harsh and insensitive they are, or maybe I don’t realize how sensitive and irrational I am being, but there’s a bit of a conflict in this relationship! I’ve spent my life dedicated to everyone around me. I tried my hardest to do my best in being a wife, daughter, mother, sister and friend. I went from childhood to motherhood rapidly, with no in between time to learn about myself. I used to laugh at people who used the term, ‘finding myself’. Who had time to do that? What did it even mean?? Now here I sit. Watching time fly by, watching my kids be young adults. Finding a new relationship with my husband, because let’s face it, raising kids has a way of changing the dynamic of our relationship with our spouse! And I just spent three glorious days alone, just God, myself and my dog. I’ve had time to digest the news, reflect on things and heal from the shock. I’m an aging woman. Even if the number of years doesn’t match the physical aging I’m doing, it’s happening. Nothing has changed really. I’m still the same youthful spirit at heart I was a month ago. I’m still the darling and beloved daughter of the Great I Am. I’m still the woman who takes off on her own to hike in the beautiful Rockies. I’m still the smiling and laughing volunteer who enjoys working with others. I’m still me, in every way that truly matters, I’m still me. I know who I am, because I have found myself. And I found myself because Jesus Christ found me.